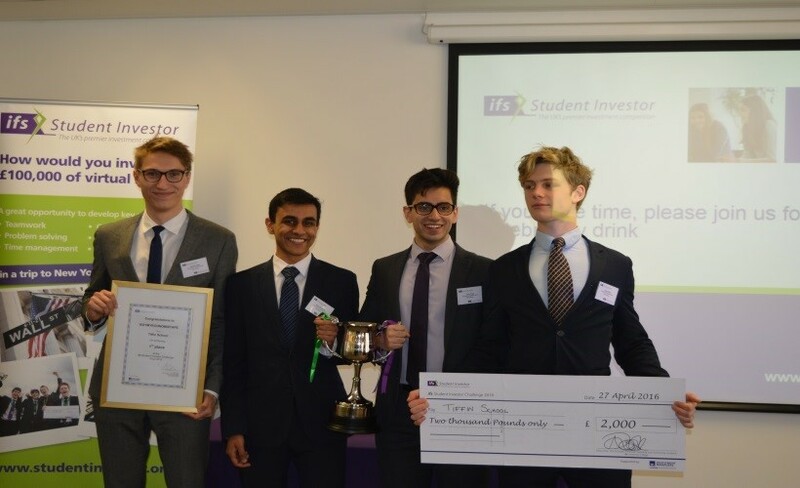 In September 2015 some 10,000 teams from schools throughout the UK registered to take part in the ifs Student Investor Challenge 2015-16. Teams who were the most astute investors on the UK stock exchanges were able to see the value of their initial virtual portfolio grow. From the initial 10,000 teams nationwide, one of Tiffin’s 15 starting teams, BUYMYECONOMIXTAPE, made it to the national finals which were held in central London on 27th April. 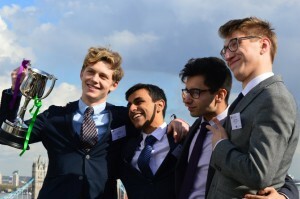 BUYMYECONOMIXTAPE, comprising Upper Sixth students Aditya Shrimanker, Arjun Popat, Lucas Tishler and Michael Tallent had two tasks for the day: firstly they took part in a fast paced live trading simulation in which they had to decide whether to buy sell or hold shares and other assets in response to a flow of news. 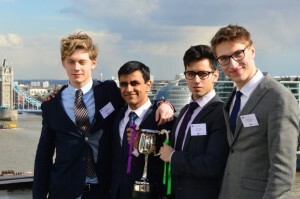 In the second of the day’s activities the teams had to give a presentation to a team of judges and invited audience (including Mr Thomas, Head of Economics and Mr Rennie, Head of Sixth Form) on a particular industrial sector and then recommending a company in the sector in which to invest. In the face of strong opposition from the seven other finalists the Tiffin presentation about the mining sector was outstanding, displaying thorough knowledge of the industry, diligent research into each of the companies in the sector and finally giving a clearly argued investment decision supported by excellent financial analysis. It was therefore thrilling hear the announcement that Tiffin’s BUYMYECONOMIXTAPE were winners of the 2016 National IFS Student Investor Challenge. As the winning school, Tiffin has been generously awarded £2000 to go with the cup and certificate. The team members themselves have won an all expenses 5 nights in New York including some spending money. Winning such a popular competition has been an outstanding achievement for the team members and, as they prepare to leave school, a fitting culmination to their years at Tiffin.